The 139th International Audio Engineering Society Convention will be the place to be for anyone involved in pro audio – and those who pre-register by Monday Oct 26 for a free Exhibits-Plus badge will be able to attend a host of key events at no charge. 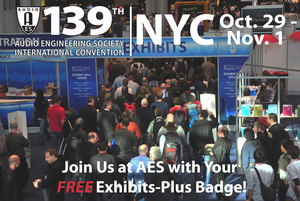 From the Opening Ceremonies and keynote address presented by Oculus Chief Scientist Michael Abrash, to Education and Career Development activities to dozens of Special Events activities including the widely popular Project Studio Expo (PSE) and Live Sound Expo (LSE) shows-within-a-show, it’ll all be available at this year’s 139th AES, October 29 – November 1, 2015, at the Jacob Javits Center in New York City. To detail just a few highlights: the Project Studio Expo, presented by Sound on Sound magazine, Genelec, Neumann and Prism Sound, will offer three days of practical presentations on getting the most out of a personal and project studio recording space. In-depth presentations will cover everything from the fundamentals to the latest tools and techniques for recording, mixing and mastering and the skills needed to build a professional recording career. The Live Sound Expo will bring expert insight and advice to live sound engineers of all types, from installed sound to Broadway to touring and house-of-worship sound. With live sound engineers comprising some 25 percent of AES attendees, the Expo will be particularly relevant in addressing key topics such as the changing state of wireless audio and how it will affect professional users, how virtual sound checks and networked audio are combining to create a more efficient workflow for live sound engineers, the latest in live sound consoles and microphones, and more. On Thursday, an all-star Platinum Latin Producers and Engineers panel will provide an in-depth look at hit-makers in the Latin music industry, and “Producing Across Generations: New Challenges, New Solutions—Making Records for Next to Nothing in the 21st Century” will take a candid look at dealing with modern production contracts and budgetary considerations. Friday’s free events kick off with “The Big Payback” Platinum Producers panel and a presentation by incoming AES President-Elect Alex U. Case, titled “The Rocket Scientist in the Recording Studio” exploring the achievements of API founder (and rocket scientist!) Saul Walker. Don’t miss the Platinum Engineers panel hosted by SonicScoop’s Justin Colletti, featuring Joe Chiccarelli, John Congleton and Chris Zane. Friday also features the return of the DTVAG (Digital Television Audio Group) AES Forum where the hottest issues in broadcast audio will be covered. Saturday’s events begin with the popular AES Platinum Mastering panel hosted by Bob Ludwig and will continue with a broadcast audio theme, beginning with a lunchtime Keynote from television game show broadcast mixer Ed Greene, followed by the GRAMMY SoundTables® presentation, “After Hours — Mixing for Late Night TV.” The final Saturday event is the traditional after-hours organ concert at the historic Central Synagogue. Sunday will host a discussion with GRAMMY®-winning Jazz bassist Christian McBride, “Leader – Sideman: The Life of a Jazz Musician,” plus a Product Development Track seminar on loudspeaker measurements, a seminar on the audio gaming world of virtual reality and more. Additionally, Prism Sound will take over the PSE stage for the day for the latest installment of their Mic to Monitor educational events, which aim to dispel many of the myths surrounding the recording process, and to answer questions such as what makes great gear “great,” what it takes to become a successful audio engineer, and how professionals tackle different aspects of their productions to create hit records. That’s just a sampling of the free events at the 139th AES. 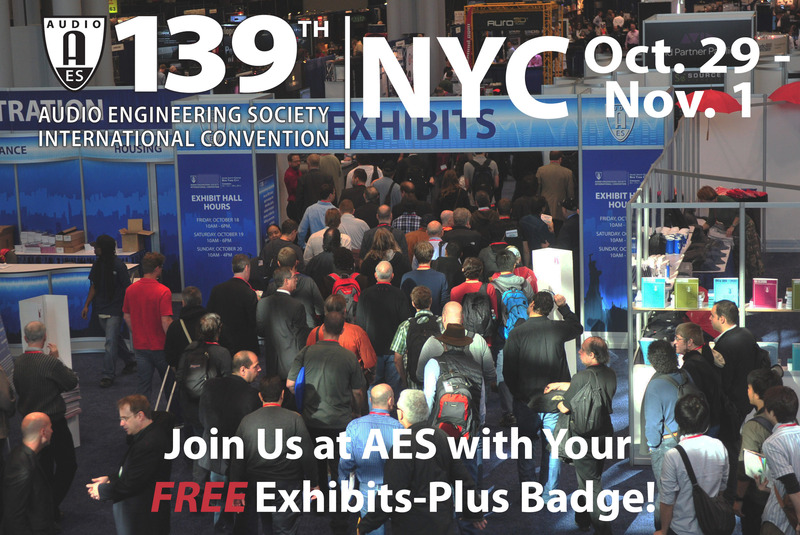 For the latest information on the AES 139 Convention in New York City and how to register for a FREE Exhibits-Plus or premium All Access badge, visit http://www.aes.org/events/139/.